There has been a renewed interest in the late-nineteenth and early-twentieth century story of the female match workers at the former E.B. 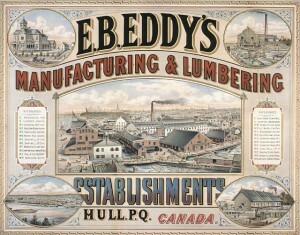 Eddy Match Factory in Hull, Quebec. For me, this is another good example of recent efforts to regionally situate the big themes of social history in Canada. It also illustrates the challenges of trying to recognize voices of labour history which for the most part do not appear in public commemoration. Match work was unsafe – hazardous to the physical health of anyone who worked in the factory – and remained so for decades. White phosphorus was used in the production of matches, long after the chemical had been linked to phosphorus necrosis of the jaw; white phosphorus matches were banned in Canada only in 1914. (In 1911 W.L.M. King, as minister of labour, had condemned their use). Fires were also a routine hazard, so common that match workers kept pails of water within reach. It took almost nothing to accidentally ignite the matches. 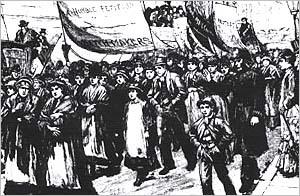 1888 Women’s Match Maker’s Strike, London, UK. Similar to the labour action at E.B. Eddy’s. The newspaper Le Droit championed the allumettières, and both the 1919 lockout and the 1924 strike prompted lively discussions in the public. The vocabulary would no doubt have been different, but we would nonetheless be familiar with the themes: child labour, gender equality, pay equity, collective bargaining, democracy, fair wages, safe workplaces. To the degree that modern audiences can tap into historical versions of this debate, they can foster among themselves “a sense of civic context and cohesion,” to borrow Alan Sears’ phrase from his essay on “Historical Thinking and Citizenship Education.” A creative approach to finding the voices of the principal actors in the allumettières drama would seem to satisfy some of the needs of civic education as well as some aspects of history education. It could form something of a bridge between the two disciplines that Alan Sears finds has thus far been lacking. In some respects, however, we have only just begun to undertake the challenges of how best to recognize historically significant local history, whether in history education or public commemoration. As Krista Cooke has noted, in her work on representing women at Canada’s public history sites, historians are tasked with handling deep complexities while cultural heritage institutions “strive to distill stories down to a single message.” Cooke also commented that women’s history tends to be overlooked because public exhibitions tend to “prioritize technology or ‘great’ events.” A third constraint is that physical evidence supporting the story of the allumettières are hard to find. “Objects of daily life that might reveal important stories are often overlooked by both donors and museums,” Cooke has written. Another challenge is the way in which much of Ottawa’s local stories tend to get taken up into the national narratives. It is perhaps a symptom of Ottawa’s “capital-complex,” as Brian Osborne has called it. The E.B. Eddy industrial complex has for many years been a national historic site. There is a plaque in honour of E.B. Eddy. Can such heritage places also become sites for marking social histories? With an openness to critical inquiry, there is potential to view local landmarks as “ambiguous sites of pondering and reflection of plural narratives,” which Osborne suggests is a more appropriate form of commemoration for the 21st century. Perhaps a good example of this is a recent initiative of the Ottawa-based Workers’ History Museum, an online museum. Last summer, volunteers with the museum set out to document Ottawa’s old Domtar buildings which once housed the city’s pulp, paper and lumber industries. In light of perspectives such as those taken by James Opp and John Walsh in Placing Memory and Remembering Place in Canada, this project can be seen as an interesting example of ordinary citizens seeking to “reclaim” capital spaces. As these local history initiatives have gained momentum, the sense has grown that the Ottawa Valley is home to a great many under-appreciated, nationally significant stories and historic sites. Here we have seen increasing interest in the history of the allumettières. In 2007, for example, an important Gatineau artery connecting Hull and Aylmer was named the Boulevard des Allumettières. The naming of the street helped to correct “a grave injustice,” the University of Ottawa’s chief archivist noted at the time. He might have been speaking of the disservice to community that occurs from forgetting, from lacking commemoration when there ought to be. More recently, there have even been public events; the “match girls” were featured in an event organized by the Public Service Alliance of Canada (PSAC) in October 2014 as part of Women’s History Month. Other acts of commemoration have centered on the digital realm. This space seems to offer at least the potential to present multiple perspectives of the parties involved: the match workers and their contremaîtresses (female supervisors), the union negotiators, management, the factory’s owners, the role of Hull’s city council and the Catholic church, and so on. A good example of the trend is the National Capital Commission’s thoughtful online exhibit “Donalda Charron and the E.B. Eddy Match Company.” With teaching resources and activities, the site is rich in contextual details and descriptions of the main actors in the allumettières’s story. To observe that the various treatments of the allumettières create silences is ultimately another way of saying that every account presents a frame, a filter. It is also intriguing to revisit the University of Ottawa chief archivist’s reference to righting “a grave injustice.” What is owed to them? How do we reconcile this notion of problematic history with David Lowenthal’s idea that in public remembrance we have a need to construct stories that are “easy to embrace”? How to address such questions through collective remembering continues to be an unanswered challenge with regard to the allumettières. We need to know much more about labouring women. More like this would be great.